There are times to go to the big cities and renowned tourist sites. Then there are times to rent a car and wander. If you wander from one small town or village to another, perhaps near a larger city or tourist area, you’ll be amazed at what you may find. This is when you get into real France, meet the local people, sample their lifestyle, and perhaps feel like a local yourself. You’ll taste the culture in an authentic way, how it is every day, not just for tourists. One way to do this is to seek out what are known as Villages Etapes. An “étape” is a phase or leg of a journey, a step along the way, which is what any of these scenic detours can be. There are 35 of them all over France that have been given this special status. Most of the officially recognized ones are in Brittany or down the center of the country, but there are others (see link below). 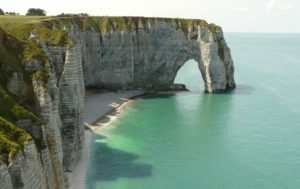 Sometimes we think of the center of France as not having as much interest as Provence or Paris or Alsace, but think again! There are interesting places all over France, and many of these come in small medieval or rural packages. Even better, instead of a hotel, stay in a gite. You’ll be surprised by villages, small towns, and local flavor. Just because it isn’t a tourist magnet doesn’t mean there isn’t a memorable excursion to be found. In fact, the fact that it is not a tourist magnet adds to the appeal of these small towns and villages. Sometimes you’ll see signs indicating the approach of a Village Etape, but it never hurts to look some up in advance of your travels if you are the plan-ahead type! You’ll be rewarded for your efforts. Here are some on the “official” list (then I’ll add a few of my own!) See below for a complete map listing of the Villages Etapes. Two of the areas I’ve posted on recently are Auvergne and Dordogne. Each of these has a few “detour towns” worth seeing. Northwest between the towns of Caen and Carnac, near Brittany and Normandy. 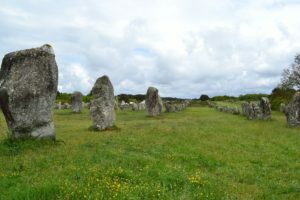 The town of Carnac and neighboring villages in central Brittany are perfect for prehistory enthusiasts. That is where you’ll find the megaliths…like Stonehenge only more than one thousand years older. No one knows how they were erected or why, but you’ll find individual stones, long rows, and sometimes circular patterns that can be seen from an airplane. These megaliths are called dolmen (flat table-like stones) and menhir, or standing stones. 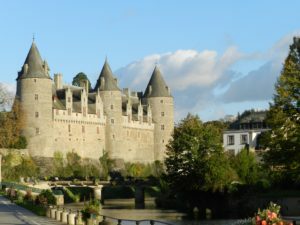 Along the middle of the country descending toward the southwest of France you’ll find villages between Orléans, at the top of the Loire Valley, and Brive near Dordogne. The town of Uzerche near Limoges has long been called the pearl of the Limousin (region) and has been on the Village Etapes list since 1996. It has since then become quite popular with tourists, thanks to the turreted houses and castle. While you are in the region, look for Donzenac, with similar qualities of medieval charm. Both of these are in the Corèze department, and you’ll find others, for sure! As you go southeast you’ll find some between the Auvergne town of Clermont-Ferrand and Montpellier on the southwest coast. Albertville: Mountain town, home of the 1992 winter Olympics. Chambéry: within a short drive or train ride from Albertville, this town is larger with a vibrant downtown. La Ciotat on the coast, near Marseilles. Castellan: a lovely walled hillside village in Provence. Carpentras: inland Provence, known for a weekly truffle market. St. Emilion: The name is this town is already well-known because of the wine that is made there, but this village 30 minutes from Bordeaux is worth a serious visit for its own sake. This medieval village was named a UNESCO world heritage site in 1999, and some say it’s more beautiful than Bordeaux. Taste, visit, admire the ancient city walls and cobbled streets. La Roche Chalais (Dordogne) Near the crossing of 4 departments and overlooks the Dronne River. Not only fishing, hiking and outdoor beauty, but this village has its own château as well. Etrétat: a wonderful small town on the English Channel. 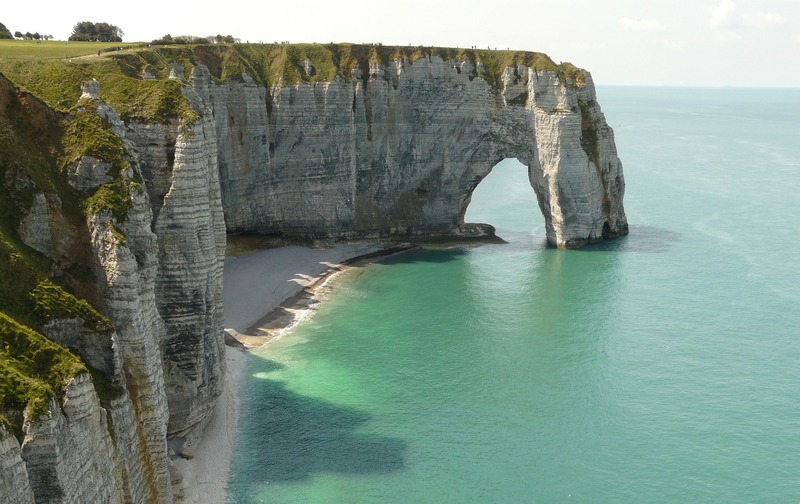 Come see the iconic rock formations and eat crêpes! 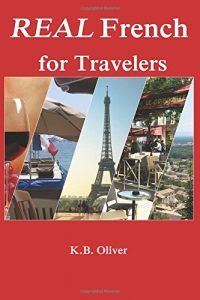 Recently Oliver’s France has talked a lot about picturesque villages and towns. 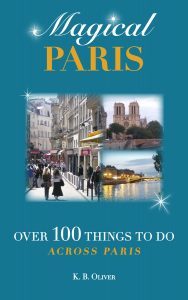 Hopefully this enlarges your view of all there is to see and do in every region of France!